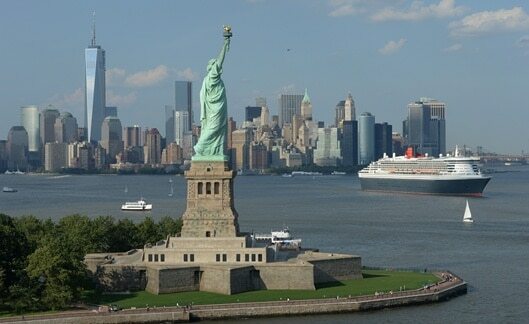 Cunard has partnered with The Statue of Liberty-Ellis Island Foundation on its crowdfunding campaign to help build the new Statue of Liberty Museum on Liberty Island. The museum is scheduled to open in 2019, and will celebrate the history of the statue and be the new home for her original torch. The partnership is a natural fit since Cunard played an important role in the immigration movement to the US in the late 1800s – one in five immigrants that came through Ellis Island arrived on a Cunard liner. Donations during the month-long campaign, which launches on July 4, will go towards the fundraising initiative being led by the foundation and campaign chairperson Diane von Furstenburg. The first person who donates $10,000 by selecting this exclusive perk on the campaign page receives a transatlantic crossing for two aboard Queen Mary 2, along with airfare. The first person to donate $5,000 receives a private tour and lunch for two in the Britannia restaurant onboard the same ship while it’s docked in New York, including airfare. The first 100 people to donate $18.86 (the year Lady Liberty was dedicated) receive a branded Cunard desktop notepad engraved with the Cunard crest. Those giving the symbolic donation of $18.86 or more will also have their name permanently recorded in the Founders Registry, a digital display in the museum and on its websites, and be collectively recognized in the Founders Star on the Liberty Star Mural in the museum. The new 26,000 square-foot museum was designed by architecture firm FXCollaborative with exhibitions created by design firm ESI Design. The structure is being built by Phelps Construction Group. Access will be free with the purchase of a ferry ticket to visit Liberty Island and Ellis Island. In celebration of their history and role in the immigration movement, Cunard is offering a Journey of Genealogy Crossing, giving guests the chance to trace their family history aboard Queen Mary 2 while sailing across the Atlantic.